Marc Gasol made his Raptors debut on Saturday night as Toronto defeated the New York Knicks, 104-99. Gasol’s streak of starting 740 games straight ended as he came off the bench for the first time since December 26, 2008. He played 19 minutes, scored seven points and grabbed six rebounds. Kyle Lowry led scorers with 22 points, provided five assists, and shot 5-7 from three. Serge Ibaka recorded a double-double as he scored 15 points and grabbed 13 rebounds. New York native Danny Green scored 14 points and went 4-6 from three. Norman Powell scored 14 points off the bench, Kawhi Leonard scored 11, provided six assists and had five rebounds. Pascal Siakam had 10 points and eight rebounds. Rookie Kevin Knox led Knicks scorers with 20 points. Mitchell Robinson scored had 15 points and seven rebounds off the bench. Kadeem Allen scored 14 points provided six assists, and grabbed four boards in 28 minutes of action. Marc Gasol entered the game late in the first quarter, and scored his first points as a Raptor early in the second. Kyle Lowry’s always plays tight and effective defence, which is why his nickname is the bulldog. Norman Powell hit a buzzer-beater to end the third quarter. 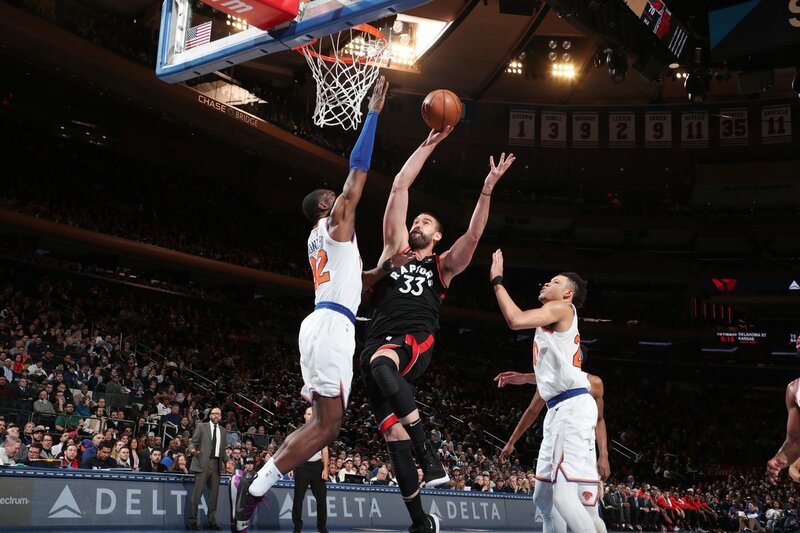 The Raptors ended their road trip 3-0, and return home to face the Brooklyn Nets at Scotiabank Arena on Monday night to start a six-game home stand.